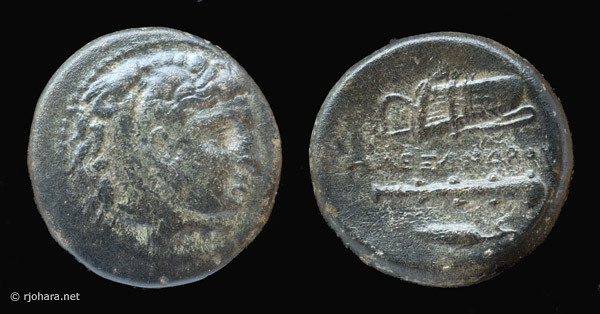 The Alexander coinage of Miletus was struck during two distinct chronological periods, separated by a gap of about twenty years. The lifetime and early posthumous issues, described here, are grouped by Thompson into eight consecutive series (I–VIII) dating from about 325–318 BC. The later Milesian issues of Alexander’s successors, grouped by Thompson into five series (IX-XIII), and the civic (autonomous) Milesian Alexander types, distinguished by the presence of an ΜΙ monogram, were produced from about 300 BC onward. The 318–300 BC gap: Philip Kinns has suggested (1986: 252) that the reduced-Rhodian silver didrachms of Miletus, dated by Deppert-Lippitz to her Period II (294–281 BC; 1984: #436–496), were in fact issued during this gap in the production of Milesian Alexanders. The political status of the city during this twenty year period is unclear, and Dmitriev notes that “[t]here seems to be a gap in the legislative activity of Miletus from the death of Alexander to the very late fourth or early third century” as well (2005: 64–66). The obverse and reverse types of nearly all coinage in Alexander’s name are a helmeted head of Athena to right along with a standing image of Nike to left (for gold emissions), and a head of Heracles in a lion-skin headdress to right along with an image of Zeus enthroned to left (for silver emissions). These types predominate at Miletus, but significant variations occur as well. The gold strikings of Thompson’s Series I include a few staters in the earlier types of Philip II, with a head of Apollo to right on the obverse and a biga to right on the reverse (Thompson, 1983: #22–23, pl. 21). And the silver of Series I includes a group of drachms with a reverse eagle to right standing on a fulmen, “otherwise attested for the mint of Amphipolis alone” (1983: #28–31, pl. 22). “The eagles seem to have been produced in small quantity but four obverse dies are known, one of which was probably used with a standard reverse” (1983: 50). The Alexandrian bronzes of Miletus fall into two groups, one with the common Heracles obverse coupled with a bow-and-club reverse (struck as part of Series III and VI), and the other with a head of Apollo to right on the obverse coupled with a prancing horseman to right on the reverse (struck as part of Series VII and VIII). Alexandrian bronzes online: A database of more than 1400 bronze coins of the Macedonian kings—including about 40 from Miletus and Mylasa—is now available online from the Greek National Documentation Centre (EKT). Thompson’s eight early Milesian Alexander series are summarized below, and the number of specimens she records for each denomination is shown in parentheses. The control marks which distinguish the different series appear on the reverses, typically to the left of or below the main figure. As noted above, Thompson’s Series I was a very large emission consisting of gold distaters, staters, half staters, and quarter staters, and silver tetradrachms and drachms. A compound ΑΗ or ΔΗ monogram distinguishes the coins of this series, many of which also carry a fulmen as an additional control mark. Thompson dates the Series I issues to about 325–323 BC. No examples are illustrated here. As noted above, the gold, silver, and bronze issues of Thompson’s Series III all feature an ear of barley as a control mark; in the case of the bronzes it appears below the reverse club. The bow-and-club reverse appears on the bronzes of Thompson’s Series III and Series VI, in the former with an ear of barley as a control mark, and in the latter with a compound ΠΥΡ monogram as a control mark. Die axes: It is not clear to me how to interpret the information reported by Thompson on die orientation in these issues. First of all, I am not sure what should be considered “up” with respect to the reverse design. Should the reverse be oriented so the name of Alexander reads left-to-right horizontally? (That is how Thompson’s plates illustrate these coins, and how I have prepared the illustration of RJO 81 below.) Or should the reverse be oriented so that the bowcase is upright, the club points down (as it would if it were leaning against a tree), and the name of Alexander reads vertically downwards? We shouldn’t necessarily assume that the name must be read horizontally, for on Alexander tetradrachms and drachms the name is typically written vertically downwards behind the throne of Zeus. If we assume, however, that the proper orientation is with the name reading horizontally, then my specimen (RJO 81) has a 9 o’clock orientation: the “top” of the reverse is aligned with the back of Heracles’ head on the obverse. And yet Thompson makes a point of recording that “the die orientation of the two lots of bronze [Series III and VI] is consistently fixed at three o’clock” (1983: 55), seemingly opposite to the orientation of RJO 81. RJO 81. 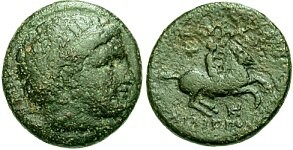 Bronze 19 × 18 mm (5.31 g, ↑←), about 323–322 BC. Obverse: head of Heracles in lion’s skin right. Reverse: bow in bowcase over inscription ΑΛΕΞΑΝΔΡΟΥ; club and barley-ear below. Compare Thompson (1983: #149–156); this specimen does not appear to be a die match with any of examples illustrated by Thompson. As noted above, Thompson’s Series VII consists of gold staters, half staters, and quarter staters, silver tetradrachms and drachms, and bronze units, all distinguished by a compound ΚΗ control mark. The bronze units of Thompson’s Series VII, with a distinctive ΚΗ control mark, differ in type from the earlier bronzes of Series III and VI, which featured a Heracles obverse and a bow-and-club reverse. The Series VII bronzes, now in the name of ΒΑΣΙΛΕΩΣ ΦΙΛΙΠΠΟΥ, bear a resemblance to the pre-Alexander types of Philip II, with Apollo’s head on the obverse and a horseman (though not a biga) on the reverse. Thompson (1983: 58) calls these “the types ... of Philip II,” but it would perhaps be better to describe them, along with the similar bronzes of Series VIII, as new types designed for Philip III Arrhidaeus and issued (as Thompson proposes) shortly after Alexander’s death in 323. RJO 105. 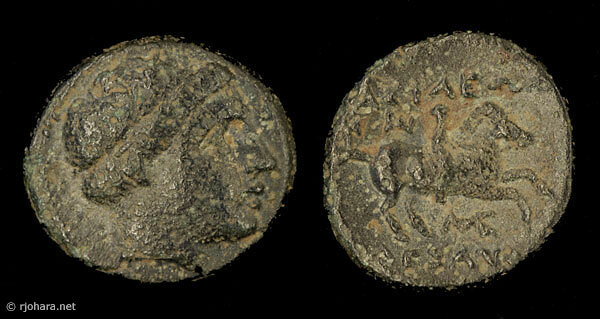 Bronze 19 × 18 mm (5.26 g, ↑←), about 320–319 BC. Obverse: head of Apollo right, hair bound with tainia. Reverse: horseman right; expected ΒΑΣΙΛΕΩΣ and bipennis above are eroded; [Φ]ΙΛΙΠΠΟ[Υ] and ΚΗ monogram below. Compare Thompson (1983: #198–203); none of the reverse dies that Thompson illustrates match this specimen. As noted above, the gold, silver, and bronze issues of Series VIII all feature a compound W-like monogram as a control mark; in the case of the bronzes it appears above the reverse horseman. The coins of Series VIII are the last Milesian Alexanders to be be struck for almost 20 years: “After this there is no [Alexander] coinage at Miletus until the very end of the century. In hoards buried between 315 and 300, only the strikings of 325–318 are present” (Thompson, 1983: 67). Milesian bronzes of this Apollo/horseman type are included in Thompson’s Series VII and Series VIII (1983: 56–60, pls. 28–29). The Series VII coins are in the name of Philip III Arrhidaeus (ΒΑΣΙΛΕΩΣ ΦΙΛΙΠΠΟΥ), and the Series VIII coins—except for the rare quarter-units—are in the name of Alexander IV (ΒΑΣΙΛΕΩΣ ΑΛΕΞΑΝΔΡΟΥ). The large denomination specimens all feature a bipennis, “heretofore…reserved for gold emissions,” and at least one additional monogram. RJO 65. Bronze 19 × 17 mm (4.09 g, ↑←), about 319–318 BC. Obverse: head of Apollo right, hair bound with tainia. Reverse: horseman right; [Β]ΑΣΙΛΕΩ[Σ] above, bipennis and W-like monogram above to left, [Α]ΛΕΞΑΝ[ΔΡΟΥ] and ΜΕ monogram below. Compare Thompson (1983: #218–219), two American Numismatic Society specimens identical to this coin but from different dies. Most bronzes in Thompson’s Series VIII have a module of roughly 20 mm (about 4.0 g), but as noted above, Thompson also records a single specimen that appears to be a quarter-unit (1983: #217, 1.19 g). The specimen below is a second example of a Series VIII quarter-unit, struck in the name of Philip III Arrhidaeus, and certainly from a different reverse die, though perhaps from the same obverse as Thompson’s single specimen. RJO 101. Bronze 11 × 10 mm (1.23 g, ↑←), about 319–318 BC. Obverse: head of Apollo right, hair bound with tainia. Reverse: horseman right; ΒΑΣΙΛΕΩ[Σ] above, W-like monogram above to left, ΦΙΛΙΠΠΟ[Υ] below. Compare Thompson (1983: #217), the only specimen she records in this denomination, certainly from a different reverse die though possibly from the same obverse die.